The seminar will be held at Sabhal Mor Ostaig (UHI), which is located in Sleat, Skye and entry to the event will be free. Financial support for the event has been received from the Highland 2007 Fund and Historic Scotland and we are most grateful for their support. The full programme of papers and speakers is presently being finalised and a full timetable will be posted on the website soon....so watch this space. 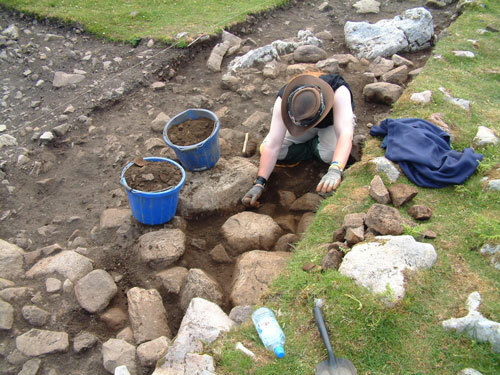 The seminar will be used to discuss the use and function of underground places such as souterrains, natural caves and other forms of man-made underground structures during the Atlantic Scottish Iron Age. However, to avoid subjecting our audience to too much ‘claustrophobia’, we will also be discussing the types of small finds recovered from such places, along with the analysis of human remains, animal bone assemblages and human and animal isotope analysis. 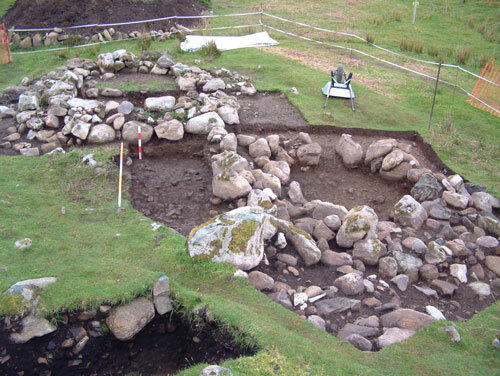 Although several of the papers will focus on the High Pasture Cave Project work, guest speakers will be presenting results of archaeological fieldwork undertaken at Mine Howe and souterrains in Orkney, and souterrains and caves in Skye. Registration for the seminar will start at 0900 hrs and the first paper will start around 09.45am. With entry to the seminar being free and open to all, we advise all potential participants to register their interest in attending. Please call 01471 888000 for the switchboard at Sabhal Mor Ostaig and book your seat. We hope to bring the proceedings to a close at around 17.00 hrs, but this may run on depending on the duration of the discussion session. Tea and coffee will be available during morning and afternoon breaks. However, if you require lunch or wish to join us for the Conference Dinner on the Saturday evening, then please arrange this while booking your seats. A limited number of rooms will also be available for booking through the switchboard, which are located on the college campus. Otherwise, work has been progressing well at the High Pasture Cave site with excavations continuing at the surface and underground. 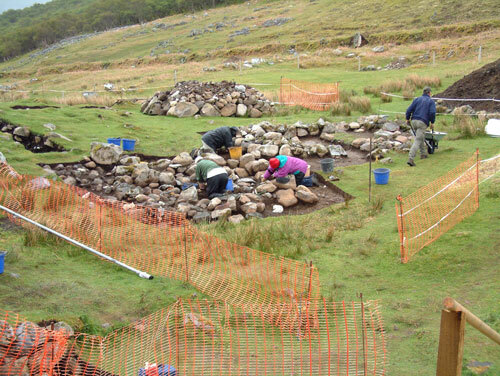 The image above shows work taking place in Trench 14, where we have been investigating two shieling structures - temporary huts or bothies that are of post-medieval date. Unfortunately, excavation in and around the structures has failed to produce any significant finds, possibly indicating that they were used for a short period of time before abandonment. 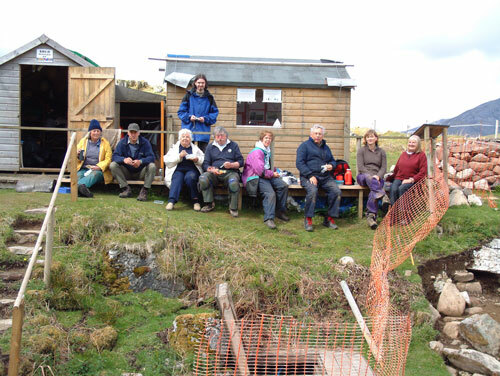 Work at the site over the last week has benefited from the arrival of volunteers from Aberdeen and Inverness, who along with volunteers from the local community, have assisted in progressing work in the surface trenches. Not much in the way of work being carried out in these images, although we do allow volunteers time for lunch!! 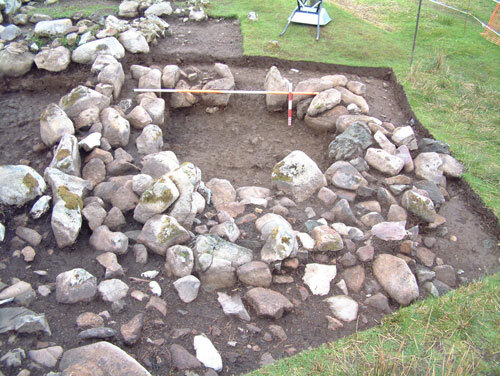 Excavation within shieling structure number 2 has shown that the main walls are built on a thin soil, which is most likely slope-wash from the hillside to the south-east. Below this, we have now revealed a compact layer of fire-cracked pebbles and stone, both within and outside the structure. Excavation is also progressing well in Bone Passage (Trench 17 in the cave), where we are removing deposits in 1 metre square grids. Up to now we have taken out re-deposited midden-type material containing animal bone, fish bone and shellfish remains. The contexts also contain significant quantities of stone (including fire-cracked material), charcoal and charred grain - mainly barley. Much of the animal bone is derived from domestic pig and as in Trenches 1 and 6, the bone shows evidence for a specific form of butchery technique including splitting the carcass of the animal down the saggital plane (backbone), dividing the animal into two halves. There have been few small finds recovered to date from these upper contexts in the trench, with the exception of a pebble grinding tool, a small fragment of a small rotary quern and a bone pin. This is in marked contrast to the archaeological deposits removed from the area around the base of the stairwell in the cave during 2005 and 2006 (see earlier reports in the archive section), and may show specific areas for the deposition of material throughout the use of the cave.